Weather plays an enormous role in agriculture. 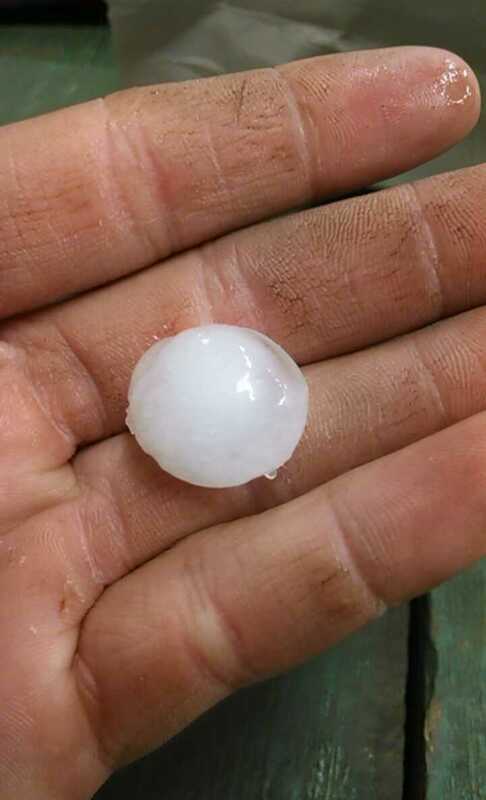 During the final week of my internship we got over six inches of rain on Monday and 3/4 inch hail a few days later. The rain kept us out the fields for the rest of the week unless we had no choice. We were in the heat of squash harvest season, and if you have ever grown squash, they don’t stay the ideal size for very long. Despite the deep mud the tractors, trailers, and workers ventured out into the fields, and commenced to get stuck a lot. They got stuck so much that it was worth it to pay someone to sit in a tractor just ahead of the one pulling the harvest wagon in order to pull it out whenever it got stuck. They came back completely cover in mud . The hail did not hit too many of our fields, but the fields that were hit were decimated. The corn was shredded and the pickling cucumbers were pounded into the ground. I had never seen anything like it. I spent most of my final days in the hopyard repairing the infrastructure. The hopyard is the seven acre field where the hops are grown. Hops are climbing vines and thus require a huge amount of infrastructure. In short there are a lot of telephone poles and a lot of wire crossing the tops of the poles with twine for the vines to grow up hanging in long rows. 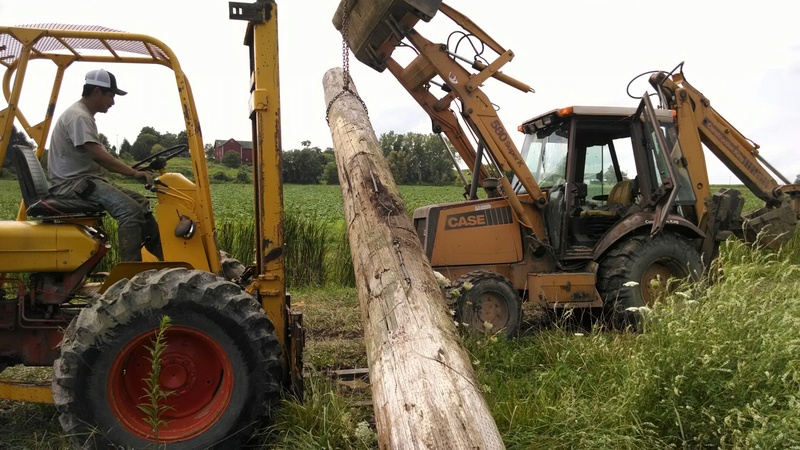 The weight of the maturing hops combined with the severe weather was too much for some of the poles to withstand, and so they snapped in half. I, along with my colleague, Ciro, spent several days using a loader and an off-road forklift, along with some other tools like an impact driver and a posthole digger, to disconnect the wires, pull out the broken poles, re-dig the holes, put the new poles in at a 65 degree or so angle, and secure them down. That concludes my summer internship with Pedersen Farms. It was an eyeopening experience which I am very glad I got. The most important thing I learned over the course of this internship is that you learn by screwing up. Honestly that is probably how I learned most of the things I did. Even after a moment or two of doubt at the beginning, I am still confident this is the right career path for me. Towards the end of July there was a lull, everything was planted, the pests were largely under control, and harvest hadn’t started yet. Half the time the fields were too wet to get on with the equipment without getting stuck and destroying the soil structure. Most of the projects were general maintenance and upkeep of the hopyard and scouting the crops for pests, disease, and deficiencies. It was during this time that I learned how to scout for the European Corn Borer, a caterpillar pest specifically in sweet corn. The Corn Borer does exactly what the name suggests: eat its way through the corn, significantly reducing the value of the crop. Evidence of their presence, depending on the generation, which depends on the time of year, can be found on more protected parts of the leaves and stalk, or in the tassels and ears. This evidence if fairly obvious, a sort of white, powdery substance around the damaged area. The extent of the infestation is determined by the number of caterpillars found while walking through the field in a random pattern. This year was a very good year in that there were very few living Corn Borers. I was told that just a couple of years ago the infestation was so bad you couldn’t walk ten feet without finding as many caterpillars. That was a serious infestation. The difference was a newly implemented integrated pest management (IPM) method. 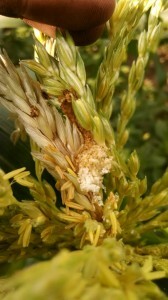 This IPM method was the release of a tiny wasp which parasitized the Corn Borer. 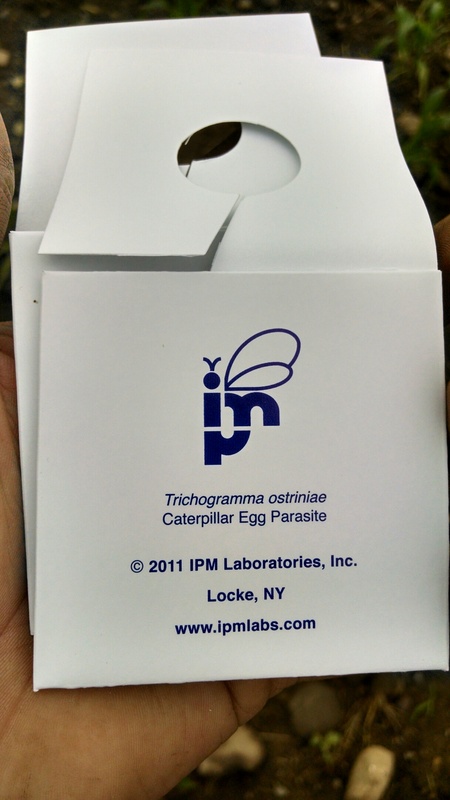 The Trichogramma ostriniae come in small packets, about 3″ square, each of which holds about 50,000 wasps. In a ten acre field of sweet corn I would put out somewhere between a dozen or two packets. The wasps were “applied” every few weeks. or some combination. 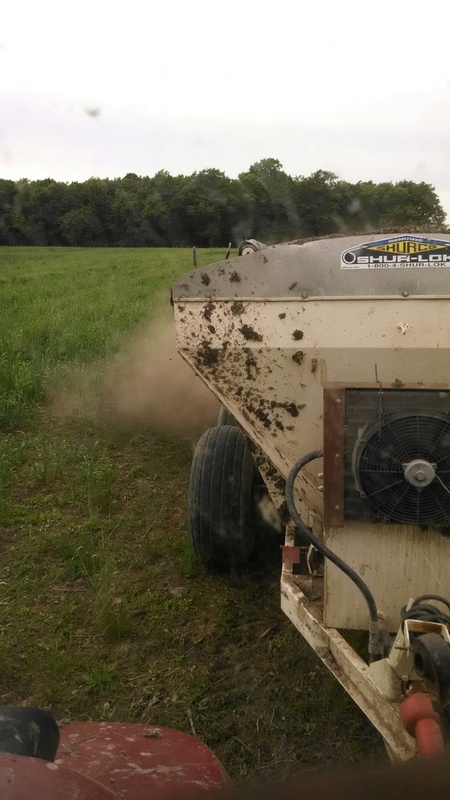 Pre-plant fertilizing is done, for the most part, and instead fertilizer is applied as a topdress or sideress application. If I wasn’t doing any of those things, I was preparing for harvest with tasks like cleaning out storage barns or getting refrigeration units in shape. I am always amazed how there is always something important to do. The first time I cultivated was an experience for sure. 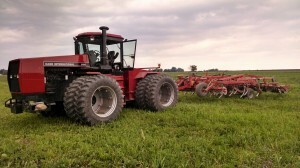 I was sent to a field in my no-cab tractor with a three row cultivator hitched to the back. For those of you who don’t know, a cultivator is effectively a series of shanks which rip through the soil on either side of the crop row, killing the weeds but leaving the crop alone, ideally. The cultivator as configured for squash on five feet centers, so there was some leeway for error, but not much. This field was a sandy soil and a side-hill. This environment meant that the back of the tractor slid downhill as I drove along, in addition, the cultivator itself was able to shift on the back. All these factors combined to me driving the tractor at a slight angle with the front wheel just shy of the row to the right in order to avoid hitting the row to the left. 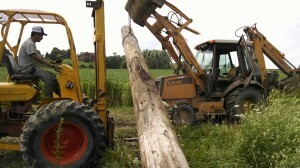 As the ground leveled outI had to steer the tractor back towards the center, to avoid running downthe crop to the right. 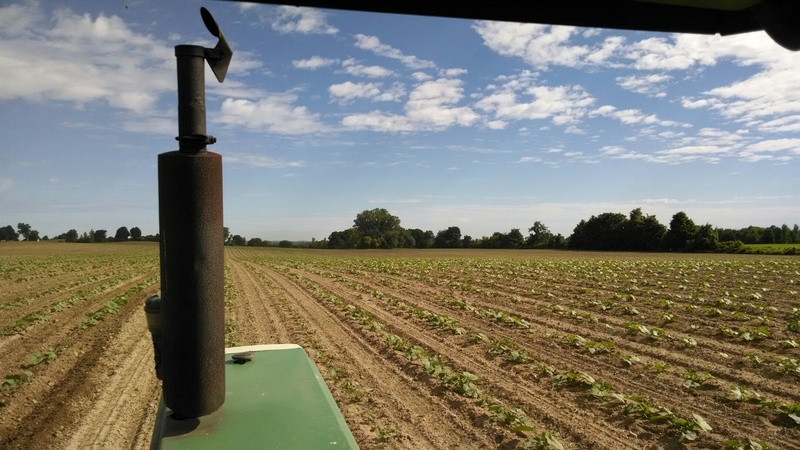 The entire time I had to watch the cultivator on the back, the front tire, and what the row was about to do, this meant that I had to look back and forth over my my shoulder and then forward. After a couple of twelve hours day of that I was sore and tired of looking at endless rows of young squash. On my second day of cultivating I learned that you do not joke about the health of a farmer’s plants. I noticed a part on the cultivator which set the depth was missing, so I was burying every third row. 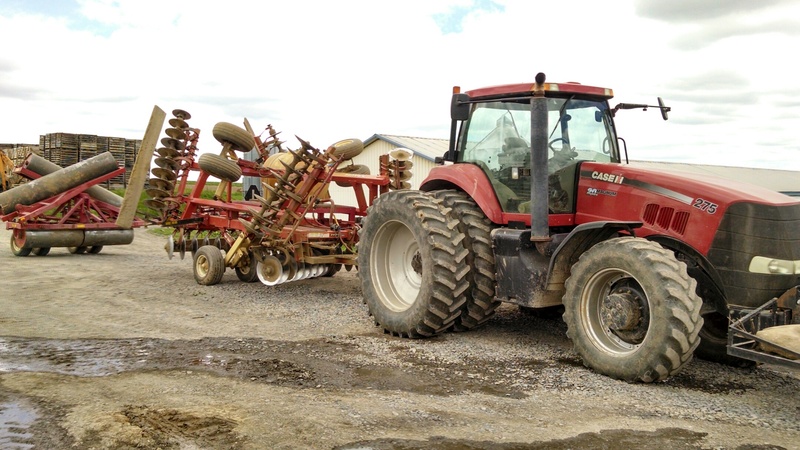 I asked Rick to bring out a replacement, and when he got there he asked what the damage was from my cultivating. I responded that I had left more standing than I knocked down and you would have thought I told him that I was aiming at the crop and not the weeds. Needless to say I did not make any jokes like that again. soybeans, so on. 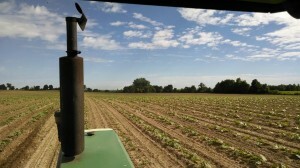 Crops like field corn, soybeans, and squash are direct seeded while crops like sweet corn and cabbage are transplanted. Direct seeding takes a lot less time and a lot less labor. It can be completed with only one or two people and the planter can move across the field, depending on field conditions, at up to six or seven miles per hour, maybe even more if the field conditions allow it. Transplanting, on the other hand, requires around a dozen people, plants six rows at a time, and can only move across the field at a mile or two per hour. Typically before anything is planted a pre-plant fertilizer is spread. I described mixing the fertilizer in the last post, and now I’ll describe what happens after that. 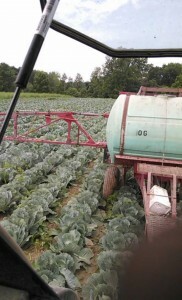 Each fertilizer is applied at a different rate, measured in pounds or tons per acre. The rate can be set by opening or closing a gate on the back of the spreader. The density was the main determining factor in setting the rate. A chart displaying a range of densities on one axis and the gate setting on the other, with the rates listed between the two.Usually the fertilizer I spread is between 45 and 50lb/cubic foot, and spread between 1000 and 1500 lb/acre. This means that the gate would be set at four or five inches. Once in the field I was supposed to drive in straight lines at forty foot centers. Until you have practiced this a few times, it is really difficult to accomplish this, and I left many winding paths through the fields.When I was first learning to use the spreader I was told it was a good idea to pace out forty feet and mark it with a flag so you have something to aim at on your way back down the field. For me, fourteen steps takes me forty feet, but I never had a flag to mark so I simply noted which tree or landmark in general to aim the nose of the tractor at. 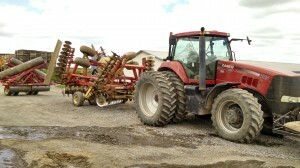 Once the fertilizer was spread, typically someone would come in with a disk or field cultivator to mix it into the soil and spread it through the root zone, making it more available to the plants. In addition, when mixed in the nutrients are less vulnerable to loss from processes like erosion and volatilization. Once this was done the planters would move into the field, sometimes while we were still preparing the field, depending on how short on time we were. This is, obviously, my first post and it is a little later than I would have liked it to be. So let’s not waste any time and get down to what I’ve been doing with my life. This summer I have been working on a large, about 1600 acres, vegetable and grain farm in Seneca Castle, NY, which is just outside of Geneva. My job description covers anything from shoveling hundreds of pounds of chicken litter all the way up to tillage and planting. I began working there in late May right in the middle of the spring rush and it was a rude awakening. I was used to the college schedule: going to bed sometime around midnight and waking up at 8:00 or 9:00 for a day of classes which, at latest, went to 4:30pm. It was a difficult transition to going to bed at 10:00, getting up at 5:30, and working until 7:00 or 8:00pm, just to do the same thing the next day. Even though I had never considered another career other than large-scale vegetable production, I spent a lot of the first week reevaluating my life decisions and considering other careers. Once I got used to the long hours, short sleep, and practically nonexistent social life I was very happy. I was coming into this internship with minimal production experience despite working on my neighbor’s vegetable farm back home for five years and on field crop research for one. Either way there is nothing that can prepare you for farmwork like farmwork. Due to my lack of experience, plus I was the new guy, I started out with a lot of busywork projects like using a loader to move a large pile of peat about 25 feet to the right and smoothing out rough spots on the lawn. As the days past I was put on more applied projects like fertilizing, tilling, planting, an so on. 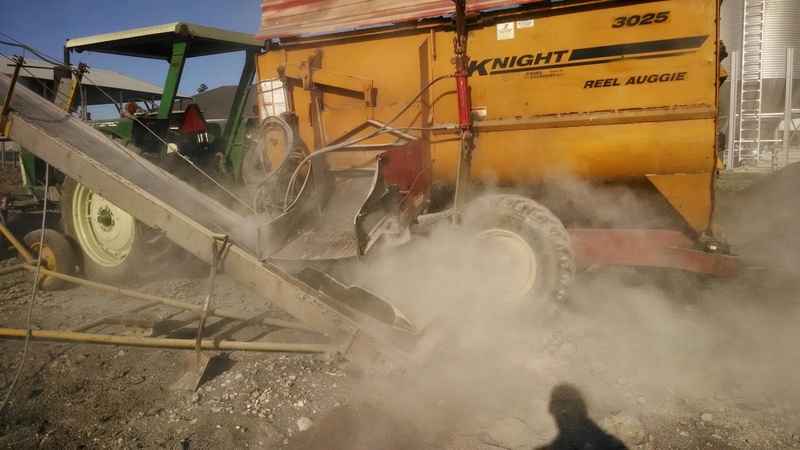 The owner of the farm, Rick, puts a lot of emphasis on pre-plant fertilizers, many of which are custom mixes mixed right there on the farm with materials including, but not limited to, chicken litter, potash, and gypsum. These were some of the materials which comprised the majority of the mixes, but in addition there were micro nutrients like sulfur, boron, zinc, copper, and diatomaceous earth. 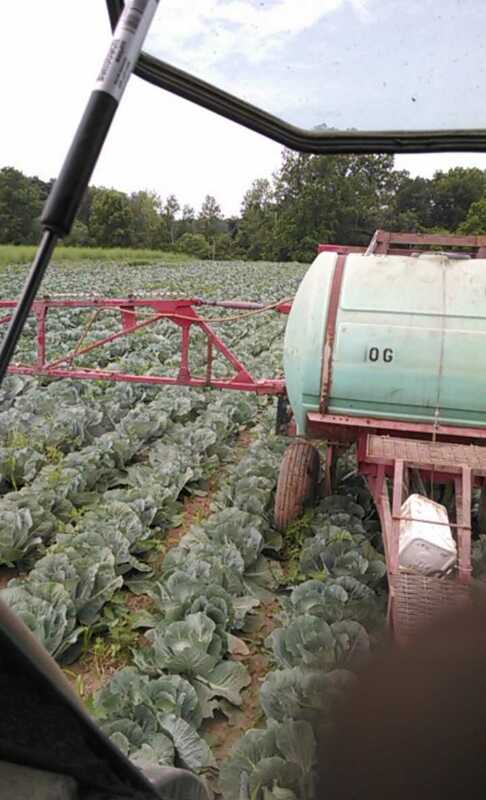 The chicken litter, while adding some nutrients, serves largely as a vector for the micro nutrients so the smaller quantities can be spread evenly over the field. 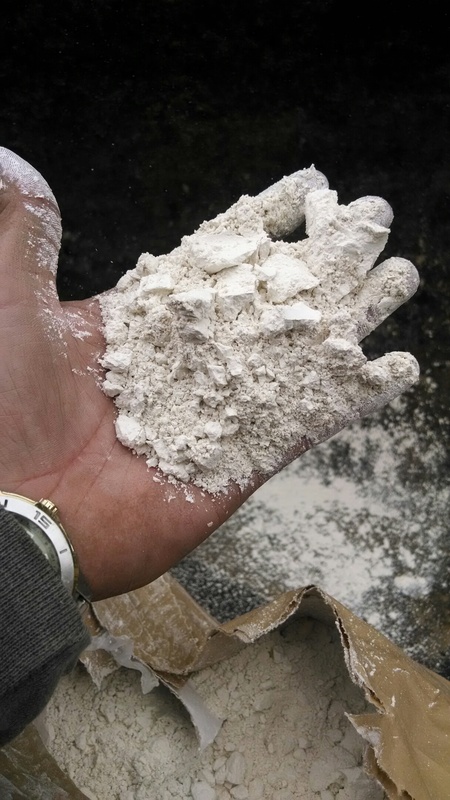 Diatomaceous earth (DE) is, in my opinion, one of the more interesting micro nutrients as it serves as a kind of natural insecticide. DE is a floury substance which coats everything, the microscopic components are shaped like fishhooks and are irritants to insects, which helps keep them out of the crop, at least for a while. Each mix is tailored to the specific needs of the field and the crop it is destined for. Some batches may have 300 pounds of sulfur while another may have none. These batches are mixed in an old feed mixer and is measured by weight. 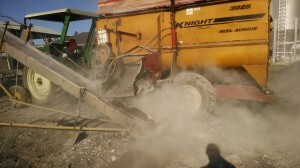 One all the ingredients have been added, the fertilizer is mixed and is transferred via conveyor belt to a fertilizer spreader and then to the field in a prescribed quantity.